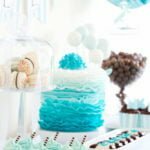 The baby shower party supplies you will need to prepare and plan on buying depends largely on the activities that will be done during the shower, what food or beverages will be served, or what party favors and gifts will be given to guests. A checklist of items and supplies needed will help you organize the purchasing efforts and ensure that nothing is forgotten or neglected. Knowing ahead of time also helps you figure out where to get the best deals on the baby shower supplies you will get. For your baby shower venue, baby-related decorations are the usual staple. The color motif usually depends on the baby’s gender. Usual decorations include balloons, streamers, banners and signs, or centerpieces for tables. 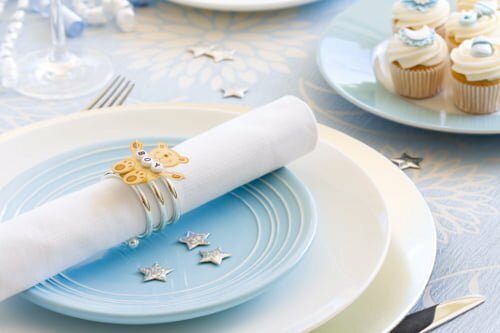 You can also make the baby shower more festive by using colorful printed disposable plates, plastic ware, table napkins, and paper cups that match the overall theme of the baby shower. Most baby shower parties are more casual in nature, so disposable plates, forks, knives, and cups are perfectly acceptable. This makes the clean-up much easier for the host as well. If you are having catered food, they may be able to provide the silverware already. Otherwise, make sure to buy enough for the invited guests. Finger foods and light snacks are the norm for baby showers. Cakes, cupcakes, and other baked goodies are popular choices. Candies, lollipops, and other sweet treats are a baby shower favorite also. Some baby shower party planners prefer designing, creating, and printing their own invitations. Know ahead of time how much paper supplies, envelopes, and other items you will need. *Tip: To make baby shower invitations more fun and creative, throw in some glitter, confetti, or stickers! 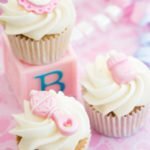 Party favors and keepsakes given out during baby showers range from very functional to purely decorative. Some gift baskets may include photo albums, baby books, bath and body accessories, and small home accessories. Others like to give out candy, baked goods, decorative toys, bracelets, anklets, or other items. Party City is usually a one-stop shop for almost any party, event or occasion you are planning. If there is one in your neighborhood, they are generally reliable when it comes to finding party supplies you need. Their online store would also be a great choice. For more cost-effective party supply buys, you can also look into discount retailers such as Amazon and Wal-Mart. If you are buying online, take advantage of special offers for larger orders, such as free or discounted shipping. Coupons and online promo codes also offer more savings for your party supplies.